Killer Covers: Three’s a Charm? 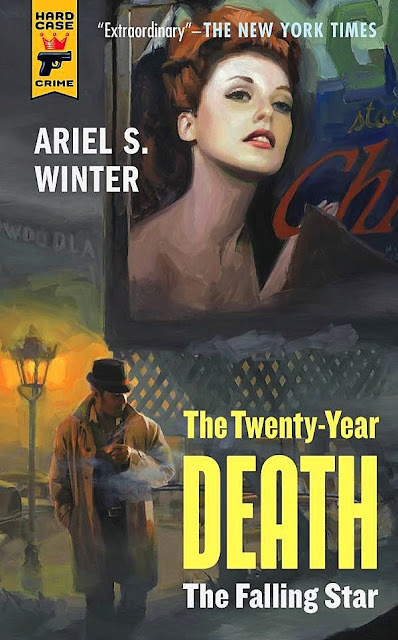 Although the book certainly had a few noticeable faults, I was genuinely fond of Ariel S. Winter’s three-part, 2012 crime novel, The Twenty-Year Death, going so far as to conduct a lengthy interview with the author (click here for Part I, here for Part II). I wasn’t at all put off by its story’s 700-page hardcover length. But I suspect others might have been, which could explain why publisher Hard Case Crime has decided to release its three constituent stories as separate paperbacks, each with its own vintage-style cover. ... in the summer of 2014, Hard Case Crime will publish the book in a different style, one we feel is a particularly good match both for the novel’s unique structure and for Hard Case Crime’s mission of reviving the style of the classic pulp paperback crime novels of decades past: a single pocket-sized mass-market paperback edition for each of the constituent novels-within-a-novel, each featuring painted cover art in a different art style suited to the decade depicted and the writing style employed. The Simenon-inspired European procedural novel, Malniveau Prison, features Hard Case Crime’s first cover ever by Joe Avery, a UK-based gallery artist who works as a painter for the internationally renowned Damien Hirst. The Chandler-inspired hard-boiled private eye novel, The Falling Star, features a painting by former Golden Gloves boxer Ricky Mujica, who previously painted the covers for Hard Case Crime’s The Corpse Wore Pasties and Casino Moon. And the dark, depraved, and doomed Jim Thompson-inspired final novel, Police at the Funeral, features Charles Pyle’s original cover painting, for which actress Rose MacGowan (Charmed, Grindhouse) posed. You can read all of Ardai’s post, and see the other two paperback fronts for Winter’s tale, by clicking here.